Computers have provisions to add accounts for multiple users so more than one person could access it while not interfering with each other’s accesses. Usually, every system would have 2 accounts: administrator and guest. 2] Go to Accounts and then open the Family & other people tab. 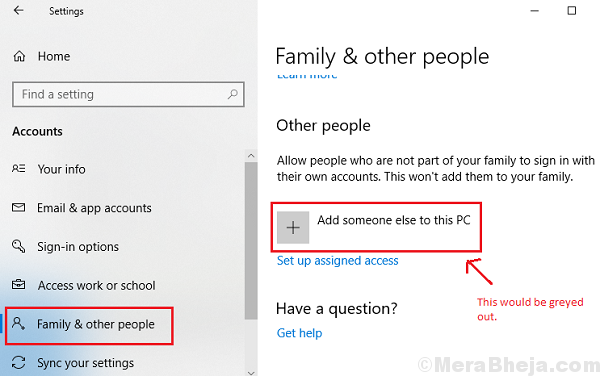 3] You could either add someone from your family or another person using the option on that window. 4] Enter a username, their password, and a hint for the password. Usually, this need to be done by the other person himself/herself. 5] Click on Next and follow the procedure to add the account. We could also add more accounts with administrator permissions. Add someone else to this PC link is greyed out. Updating Windows updates everything from associated drivers to security options. Thus, a lot of possible causes behind this issue could be solved with a simple Windows update. Here is the procedure to update Windows. 1] Press Win + R to open the Run window. 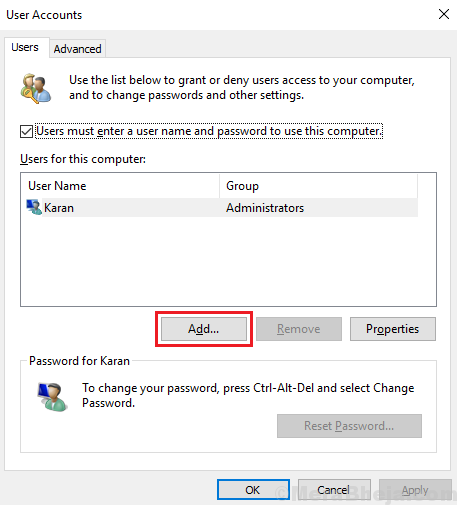 Type the command netplwiz to open the User accounts window. 2] Click on the Add button to add the account. However, this method would require mentioning the domain. Consult your Network administrator for the same. Note: The options differ for users who wish to sign in through their Microsoft account and those who wish to sign in through the local account, the former being the easier one.